Since the release of my book, I’ve been trekking around the world sharing my story and unique teaching strategies. If you’ve been following this blog, you’ll know I’m a huge advocate for adapting teaching methods to how a student learns best, and not the other way around. It’s how it worked with my first student—my son, Nicholas—and how I taught hundreds of vulnerable learners ever since. One of my favorite things to do is visit different schools and speak to educators. While I know the education system has begun taking strides and working closer with struggling students, we still have miles to go. So, I continue to share my practices as often as possible, to spread hope that there are simple and enjoyable tactics educators can use with each of their students. 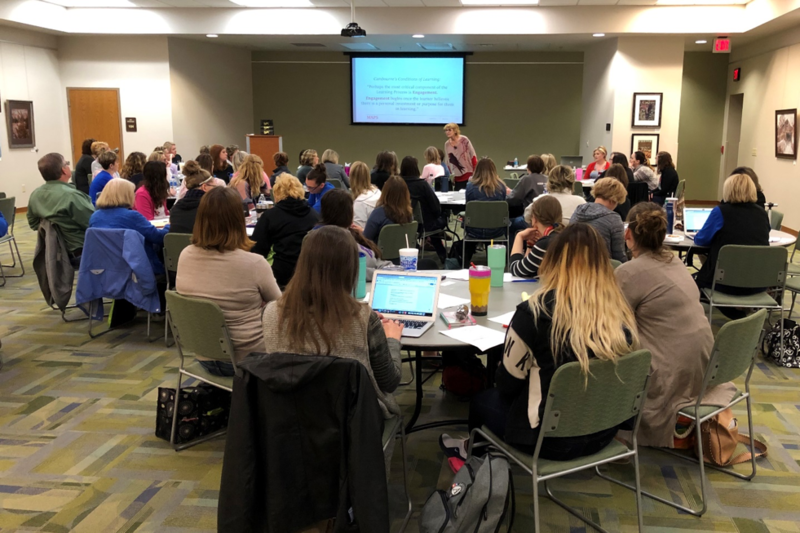 This month, I had the pleasure of giving a full-day seminar to more than 50 reading teachers, social workers, and speech therapists in the Derby, Kansas School District. Victoria Griffith, a Derby band teacher and mother of a now-successful dyslexic child, had read my book and connected with Robin Folkerts, an instructional coordinator for ELA/arts/social studies. Together, we organized this intensive workshop, where I discussed things like the power of re-reading, the challenges with the oral and written language, and implications for teaching decoding. We pulled apart language and its challenges, presenting solutions. One of the more interesting exercises in the workshop was asking attendees to try to see the world as the “vulnerable reader” might see the written word and to think and learn like a child who has learning differences. For a few minutes, we could only speak in sentences that didn’t have the letters “a” or “e,” providing a significant challenge for all. There was much excitement in the room as it took great effort to produce words without these prominent letters. In that time, we could all feel with our students. I hope to be able to continue helping and sharing knowledge, and connecting with educators just like me. We have much to do as teachers, and this is where we begin.